I cannot keep up with my consumption of egg whites in candy making. With cakes and pastries, recipes often call for yolks and I end up with an abundance of egg whites. That’s easy to manage because the whites keep well in fridge. Yolks, on the other hand, tend to dry out or at least much more perishable. With many candy recipes calling for egg whites, I just can’t balance it all without being wasteful. And throwing away egg yolks is a crime in my eyes. I can only make so many batches of ice cream, pastry cream, and custard. It’s only logical that I want to experiment with egg whites in a carton. It is cheaper than buying whole eggs and I would not need to worry about what to do with the yolks! I bought a carton of free run egg whites to experiment. The brochure claims that it is good for making meringue and angel food cake, both of which depends highly on how well the egg white whips to volume. 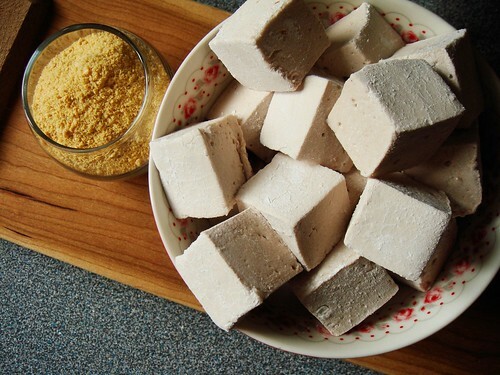 I used the tried and true marshmallow recipe from The Liddabit Sweets Cookbook. 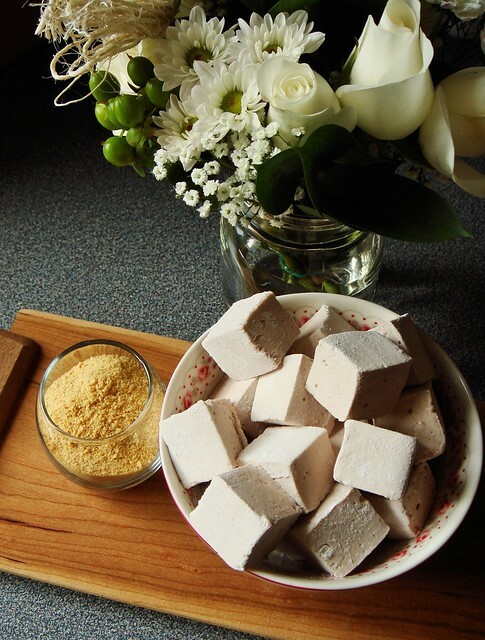 This recipe gave me endless joy in the form of matcha kinako, strawberry orange flower, yuzu, marionberry amaretto, and ginger flavour homemade marshmallows. I am confident enough by now that I would not mess it up. The success and failure would be entirely dependent on the use of liquid egg white. This time, I would flavour the batch with 1 1/2 tablespoon of cocoa powder and 2 tablespoons of malted milk powder. First thing I notice is that liquid egg white is thin and runny compared to fresh whole eggs. It makes sense because even fresh egg white turn runny the older it gets. For my purpose, it was an issue because the wire whisk of my stand mixer had trouble grabbing the egg whites to aerate. It took much longer than normal to even turn foamy. It was barely able to whip to soft peak before I started adding hot syrup to make Italian meringue. Once all the syrup was added, the meringue seemed fragile and did not have the stable structure I normally expected from Italian meringue. The addition of bloomed gelatin was my saviour. Remember that many marshmallow recipes actually depend entirely on whipped gelatin for its structure? The gelatin stabilized the meringue after an extra 50% longer time of whipping. Luckily, I managed to get the same volume I expected from this recipe. However, the marshmallows had a creamier consistency similar to those made without egg whites. The experiment is not a failure. In this particular application, it worked out alright in the end. However, I will avoid egg whites in a carton for meringue-related recipes in future. The taste of cocoa and malted milk powder was subtle. I certainly do not mind a more assertive malted taste if I am going to dip these marshmallows in milk chocolate. A coat of chocolate can easily overwhelm the delicate taste. The bigger problem was that I had an almost full carton of liquid egg whites. I am not the egg white omelette type of person, not in a million years. Yet I cannot use it in any recipes that depend on its aerating ability. Ah ha! Financier comes to the rescue (recipe here). I love making and eating these tea cake/cookie hybrid with the deep nutty taste of beurre noisette and ground nuts. 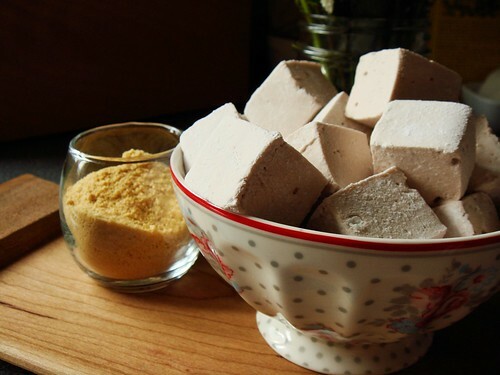 Do you also know that there is no leavening agent in financier? The cooked batter is a simple mixture of egg white, sugar, ground nuts, flour, and beurre noisette. 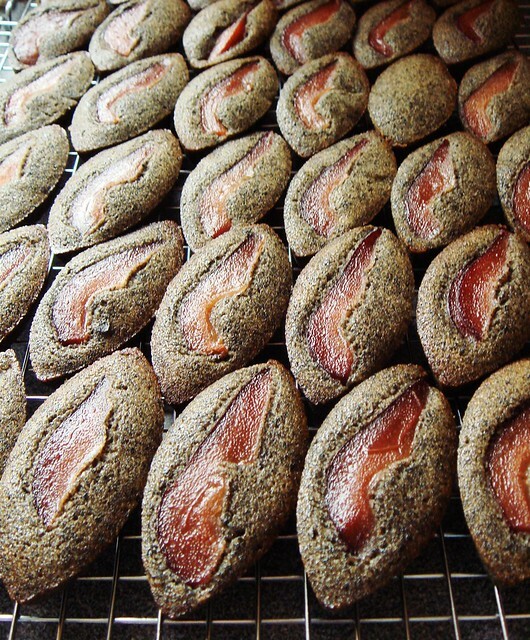 I made a double batch of my favourite variation: black sesame with poached pear. Not only did I finish the carton of liquid egg whites, I also decimated the odd poached pear in the fridge. And I have a big basket of delicious treats to serve with afternoon tea. How awesome is that? Liquid egg white, be glad that you redeem yourself with financier.